She did make it to the Ren Faire yesterday and watched the jugglers, belly dancers, pirates, swordsmen galore. She looked at fares and marveled again at the creations of Cinnamon & Myrrh who use old school blacksmith techniques to forge their items in copper and other metals. Her new favorite was a nice lady named Caroline who makes customs hats. The Wicked Hatter she is called and they exchanged business cards and the Owner will try to get some photos of the awesome Top Hats and masks this lady makes as her current website only shows what she can do with a witches conical hat. As the Owner is pursuing her own path with her business by hosting her passion for herbal blends and other things, she loves finding others who are pursuing theirs. When she can locate a good site for Cinnamon & Myrrh items she will share that with you as well. Hand crafted or nature created, all of it is beautiful in its own right and the uniqueness makes them something to behold. Today we give you a picture provided by Creepy, Strange, and Weird of natures formation over river rocks in Italy. 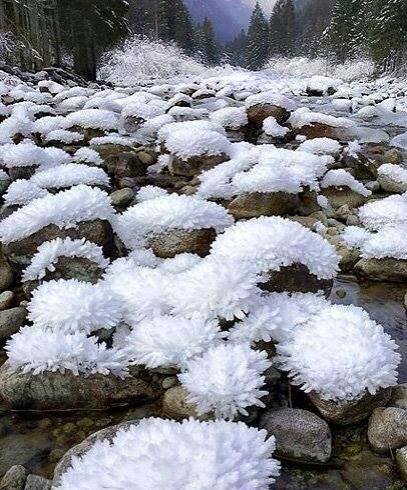 At first we thought it was flowers, but in fact it is ice. Be safe on the roads this Wintery Monday. Brightest Blessings on Your Path!